Properties in Obergiesing-Fasangarten average 4.4 out of 5 stars. 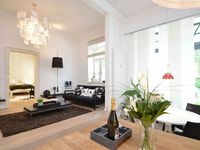 Property 5: A complete holidayflat with two rooms in Munich. Location near S-barn. We loved having two separate bedrooms.